Soprano Christina Kowalski’s singing of Wagner’s “Wesendonck Lieder” at the Vancouver Symphony concert this afternoon (Saturday, January 24) was superb. Kowalski sang with grace, power, and a terrific understanding of the arch of each phrase in the five songs. Her top notes were golden and all tones down to the lowest were solid and full of dramatic intensity. She communicated with passionate intensity and impeccable diction (even a non-native German speaker like this reviewer could understand each word). Overall, she gave a luminous interpretation of Wagner’s music. Kowlaski was supported expertly by the orchestra under its Music Director Salvador Brotons. The orchestral sound was kept in check, which allowed Kowlaski’s voice to soar freely. The elegant cello and oboe in “Der Engel”, the muted horns and the slowly ascending violins in “Im Triebhaus,” and the evocative horn and oboe solos in “Träume” glimmered from within the sonic texture. If the flutes could have been softer at the end of “Im Triebhaus,” then that piece would have sounded even better. Also on the program, was the Brahms’ Third Symphony, which the orchestra played intelligently and with great spirit. The violins put an impressive verve into their attacks and almost always commanded a unified sound. The lower strings also played with greater unity than I’ve heard in the past. The treacherous horn solo in the third movement was deftly fielded by principal Allan Stromquist. The woodwinds and the brass played with great expression and intensity. Brotons, conducting from memory, urged the orchestra with a huge variety of gestures and expressions. The orchestra wasn’t flawless (for example, there were some intonation problems in the strings in the third movement), but it was an impressive outing that shows how far this orchestra has come. The concert got off to a sultry, jazzy start with Gershwin’s “Cuban Overture.” The percussion battery had a field day with the infectious rumba rhythm, and principal trumpet Bruce Dunn led the trumpets in stirring up the heat. The principal woodwinds laced their solos with care and the strings layered it all with a lush sweep of sound. Under Brotons, all the musicians seemed to be having fun. Because of it has a wild finish, the Gershwin piece generated a lot of enthusiastic applause, and the Brahms and the Wagner were also well appreciated by the audience. But Kowalski’s performance was the highlight of the concert. Hopefully, she will be back invited to sing again with the orchestra in the near future. I didn't realize until today that the full name of the Donetsk International Airport in the eastern part of Ukraine is actually the Donetsk Sergey Prokofiev International Airport. It may be the only airport in the world named after a composer. The Wikipedia states that the airport "was built in the 1940s and 1950s and rebuilt in 1973 and again from 2011 to 2012. The airport is named for 20th-century composer Sergei Prokofiev, who was a native of Donetsk Oblast." Unfortunately, Ukrainian forces and separatist Russian forces have been battling over the control of the Donetsk Sergey Prokofiev International Airport. This Reuters report shows recent photos of the destruction. Hopefully, someday soon the airport will be reopened, and all people (including musicians and composers) can safely fly in and out. After writing this, I remembered that Poland has the Warsaw Frederic Chopin Airport. So there is at least one other airport named after a composer. I published an interview with Dr. Mike Hsu in Oregon Music News, regarding his ensemble ARCO-PDX, which presents a new approach on exposing younger audiences to classical music. ARCO stands for Amplified Repertory Chamber Orchestra. Those of you who ponder the future of classical music may find the article of special interest. Greer Grimsley (Baron Scarpia) and Ausrine Stundyte (Floria Tosca) in Puccini's Tosca. Stundyte’s vocal prowess was first rate, and her singing of “Vissi d’arte” a highlight of the show, but the top end of her voice didn’t shimmer as much as Secco’s. Grimsley sang with a stentorian heft, barking orders to torture Cavaradossi, threatening Tosca with his imposing presence, and topping it all off with a smart and smug attitude. Alasdair Elliott created a vivid impression vocally and in the acting category as the detective Spoletta. Aubrey Allicock plunged the audience into the midst of his desperate situation as the political fugitive Angelotti . Peter Strummer brought just the right mix of piety and amiability to the character of the Sacristan. Barry Johnson distinguished himself in the role of the police sergeant Sciarrone, and Matthew Bratton’s plaintive voice was perfectly suited for the song of the Shepherd Boy. Bulgarian conductor Julian Kovatchev elicited a magnificent sound from the orchestra. It became a little too magnificent at one point in the second act and actually drowned out Grimsley for a few measures, but it didn’t overwhelm the stellar sound from the chorus, expertly prepared by John Keene, during the spectacular religious procession (“Te Deum” scene) at the end of the first act. The stage directions of Jose Maria Condemi gave this production of “Tosca” a realistic feel. The death of the evil Scarpia was so palpable that many in the audience responded with applause. The painted sets of Ercole Sormani suggested the faded glory of Rome, but the best moments came in the final act when the lighting of Connie Yun gradually changed the night sky, dotted with stars, to a morning sky, pillowed with ominous clouds. 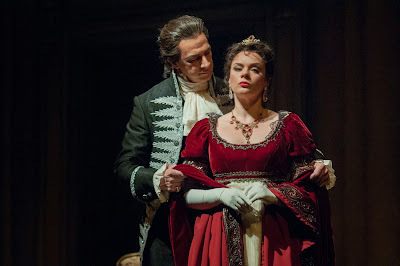 New York City Opera, which is in Chapter 11 bankruptcy, provided traditional costumes that fit this production to a T.
The strong cast and superb directing from Condemi make this production of “Tosca” another feather in Seattle Opera’s cap. It runs through the 24th. The Spring for Music Festival, which brought many orchestras - including the Oregon Symphony - to Carnegie Hall, ran out of money. But, fortunately, the festival concept is being resurrected and re-structured by Deborah Rutter and the folks at the Kennedy Center. It's called Shift: A Festival of American Orchestras. According to Musical America, the festival, which is scheduled to get underway in the Spring of 2017, is funded by $900,000 from the Andrew W. Mellon Foundation, $700,000 of which is matching funds. Shift will place its emphasis on the artistic excellence of the orchestra and its relationship to the community. For more information about Shift: A Festival of American Orchestras, read this account in The Washington Post or refer to this one in The New York Times. Of course, you can also take a look at the festival announcement from the Kennedy Center. So this presents another chance for the Oregon Symphony to hit the big time and make another huge, positive impression like it did at Carnegie in 2011. A couple of weeks ago, composer, impresario, Mr. March Music Moderne, and tireless advocate of new music, Bob Priest, sent, via email, a compilation of concerts that feature new music during the month of January. With his blessing, I'm re-posting this schedule (minus the first couple of concerts that already flown by) so that you might consider attending one of the performances. An interesting, if not too surprising, phenomenon of note at Oregon Symphony concerts (as is true at any major symphony I'm sure) is the 'post-hit desertion.' That is to say, if the big, famous, popular work (you know, a Rachmaninov 3 piano concerto or a Dvořák Cello Concerto in B Minor) is played in the first half, then a certain portion of the audience tends to...disappear before the less popular work(s) of the second half. Maestro Kalmar addressed the very fact that the OSO was flipping the traditional concert order on its head by playing the big symphony first, then the concerto and overture-like works last. So as it was, everyone who wanted to hear Ravel's Bolero had the great pleasure of sitting through the marvelous, lesser-known offerings by Dutilleux, Messaien, and (arguably) Franz Liszt. Opening with Henri Dutilleux's Symphony No. 1 was a bold stroke for the OSO, and it worked out well. The at-first-barely audible string pizzicato, and its subsequent ingenious passing between sections was deftly handled. The work as a whole was marked by radical contrasts; long, slow singing sections interrupted by thunderous crashes from percussion or brass, and then a sudden, quiet reversion into subtlety. It demanded intensely rhythmic ensemble playing to navigate the tempestuous, moody texture, and a focused approach was necessary to keep interesting the sometimes abstruse tonal (or atonal) musical languages of this mid 20th century piece. The OSO certainly had the skills to navigate all those challenges. Olivier Messaien's Oiseaux exotiques (Exotic Birds) was a startling change. Consisting of winds, percussion and piano, it was patterned after the songs of 18 birds from around the world. Messaien, a bird-lover himself, could clearly articulate not only the bird song but convey images of hopping, dancing, flitting and strange avian rituals that only a bird-enthusiast and accomplished composer could so convey. Pianist Marc-André Hamelin had an interesting role: pouncing, plunking, thundering and whispering delicacy were all called for. The dizzying amount of coordination between the percussion and winds, especially at such a sustained and rapid-fire pace, was amazing to behold. Precision, rapt concentration and lightning execution were all present in this stunning, boiling euphony. The second half opened with Liszt's Todtentanz for Piano and Orchestra. The opening, menacing theme, at which death seems to stride the world, immense and unchallenged, gave way to scintillating brilliance on the part of Hamelin. Suddenly he displays a jolly, crisp and brilliant staccato, firing away exacting glissandi one after another. He then plays with such cantabile tenderness in the quasi-fugal portion, a feeling like retiring into death's cool embrace. The astonishing amount of technical accomplishment alone, to say nothing of his artistry--Hamelin had every bit of the chops and then some; for much of this piece he was a one-man orchestra. Ravel's Bolero was the grand finale. The bassoon in particular rendered the theme splendid and saucy. It was great fun to see an army of violinists and violists holding their axes like small guitars, plucking away. The piccoli had some difficulty with the doublings, but it was a small blemish. Kudos to the snare drummer and his rock-solid rhythm, the only player to hit every single beat from the first to the last. The percussion section and winds in particular were spectacular all evening; it is a joy to listen to such top-notch performers night after night with the OSO. If you are fond of pure violin music (that is, without accompaniment of any sort), then you should listen to the music of Jean-Marie Leclair in “The Complete Sonatas for Two Violins” in a recording that was released last year under the Sono Luminus label. You’ll hear two of the Northwest’s top violinists, Greg Ewer and Adam LaMotte, perform Leclair’s sonatas so superbly that you’d think they were same person. Their playing exhibits incredibly matched timing, excellent tonal balance, and elegant dynamics – all of which combine to bring out the sinewy textures and subtle colors of Leclair’s sonatas in this 2-CD set. Together, Ewer and LaMotte make a strong case for the Leclair’s music, which has been quietly residing in the dust bin for quite some time. The recording of Leclair’s sonatas for two violins by Ewer and LaMotte fills in a gap that has been ignored for a long time. Hopefully, they will find another recording project soon. 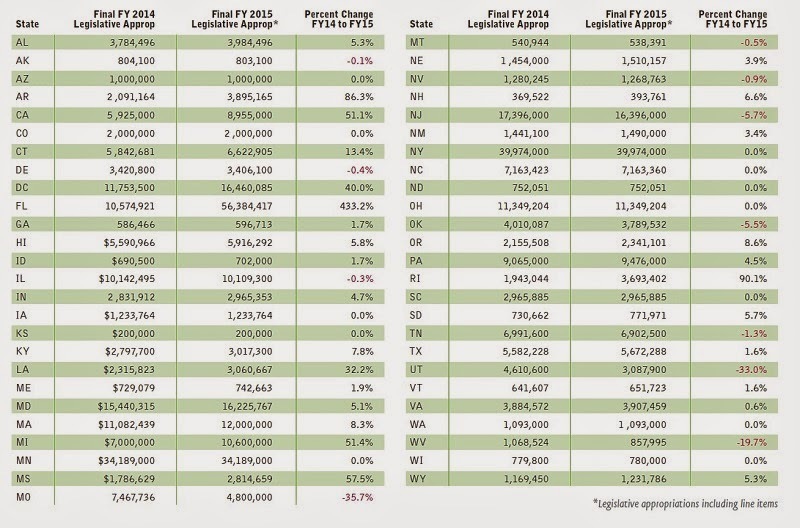 State legislatures have determined their budgets for FY 2015, and arts funding continues to grow - especially in Florida, whose appropriation increased by more the 350 percent. Where does your state fall? As you can see (hopefully), Oregon increased its funding for the arts to $2,155,508. That is much better than Washington ($1,093,000), Idaho ($702,000), and Montana ($538,391), but it doesn't compare very well with Minnesota, which has budgeted $34,189,000. The Oregon Symphony today announced that its upcoming CD—the third under the baton of Music Director Carlos Kalmar—is set to be pre-released locally on the Pentatone label on January 8. This latest CD, entitled Spirit of the American Range, follows Music for a Time of War, a recording of the program performed at the Symphony’s 2011 Carnegie Hall debut which hit the classical billboard charts and received numerous critical accolades including two Grammy Award nominations, and This England, released in 2012. Like its predecessors, Spirit of the American Range was recorded in hybrid multichannel Super Audio CD format. The CD features works by Aaron Copland (Symphony No. 3), Walter Piston (Suite from The Incredible Flutist) and George Antheil (A Jazz Symphony). These works were recorded live at the Arlene Schnitzer Concert Hall in April 2013 and January 2014 by Soundmirror recording engineers John Newton and Blanton Alspaugh, both of whom engineered the two previous CDs. Spirit of the American Range will receive its first radio broadcast on Portland’s own 24/7 classical music station, All Classical 89.9 FM (streaming internationally at allclassical.org), at 7 pm on January 8. The recording was made possible in part by the James DePreist Fund for Broadcast and Recording. Following its local release, Spirit of the American Range will be available for purchase only at the Oregon Symphony Ticket Office (923 SW Washington) or at the Pentatone website (pentatonemusic.com) until its official international release in February 2015, when it will become available at most music outlets. Seattle Opera to open 2015-2016 season with Verdi's "Nabucco"
It’s a new era at Seattle Opera. The company today announced its 2015/16 season, the first to be presented by General Director Aidan Lang, and a return to full-year programming with a total of six operas, including new productions and a world premiere. Under Lang’s leadership, the company hopes to serve the community through the magic of theater and music in McCaw Hall, and in learning and engagement programs across the Pacific Northwest. The 2015/16 season includes two company premieres: Nabucco (Verdi) and Mary Stuart (Donizetti); a world premiere: An American Dream (composed by Jack Perla with libretto by Jessica Murphy Moo) conceived from the company’s community storytelling initiative, the Belonging(s) Project; and new-to-the-company productions of The Marriage of Figaro (Mozart), The Pearl Fishers (Bizet) and The Flying Dutchman (Wagner). In addition to mainstage performances, programs that serve the community are at the heart of Lang’s vision. In the 2015/16 season, Seattle Opera launches the Flight project, a multi-year series of programs and events that includes the commission of a trilogy of new operas for family audiences and in-school performances. Flight is modeled on the three-year Our Earth project, which to-date has served 31,893 people in more than 158 performances. The mainstage season kicks off in August 2015 with a new production of an opera that’s never before been presented in Seattle: Nabucco, Verdi’s first masterpiece. The power and grandeur of the Old Testament story will come alive with innovative staging designed to bring the audience right into the action and closer to the music, notably the famous chorus “Va, pensiero.” Gordon Hawkins returns in Verdi’s first great baritone role, the King of Babylon. Mary Elizabeth Williams takes on the challenge of his fearsome daughter, Abigaille. Christian Van Horn makes his Seattle debut as Zaccaria, the High Priest. Russell Thomas returns as Ismaele, and Jamie Barton makes her Seattle Opera debut as Fenena. Italian conductor Carlo Montanaro returns following Verdi’s Attila (2012) and more recently, The Consul (2014). François Racine, who won Seattle Opera’s Artist of the Year Award for directing the acclaimed Canadian Opera Company production of Bluebeard’s Castle and Erwartung (2009), returns to direct a new production with sets by Seattle Opera’s own Robert Schaub (The Magic Flute, 2011); projections by Robert Bonniol, MODE Studios; and costumes by Ginette Grenier. Running concurrently with Nabucco in August is the world premiere of An American Dream—an opera based on real stories from the Pacific Northwest. The heartbreak of World War II binds strangers together after a Japanese American family is forcibly removed from where they live on an island in Puget Sound, and the new residents slowly piece together the history of their home. Morgan Smith (Seattle Opera Young Artists Program graduate) returns to create the role of Jim, an American soldier married to Eva, a German Jew who has fled the Nazis and moved to the Pacific Northwest. Making their Seattle Opera debuts are D’Ana Lombard as Eva and, as the Japanese American family, Nina Yoshida Nelsen (Hiroko Kimura), Adam Lau (Makoto Kimura), and Hae Ji Chang (Setsuko Kimura). Conductor Judith Yan makes her Seattle Opera debut. Peter Kazaras, longtime Seattle Opera director, singer and former head of the company’s Young Artists Program, returns to direct following The Consul. The simultaneous presentation of An American Dream with Nabucco is in itself a compelling artistic choice, and a deliberate pairing by the company’s general director. Next, Bizet’s hypnotic love story The Pearl Fishers heats up the fall. Internationally beloved designer Zandra Rhodes returns following her Artist of the Year Award costuming Seattle Opera’s The Magic Flute (2011) to create a grand vision of exotic splendor and vibrant color with her sets and costumes. Maureen McKay, a Seattle Opera Young Artists Program graduate who has gone on to impressive achievements in Europe, makes her mainstage debut as the beautiful priestess Leïla. John Tessier and Brett Polegato return to sing the two men who love her, Nadir and Zurga. Jonathan Lemalu makes his Seattle Opera debut as Nourabad. Both stage director Andrew Sinclair and conductor Emmanuel Joel-Hornak make their Seattle Opera debuts. During the holiday season, Seattle Opera’s Education Department will deepen its collaborative partnership with Seattle Symphony. The Youth Opera Chorus will again perform with the symphony for its holiday concert on December 15, 2015 at Benaroya Hall. Additionally, the two companies are introducing a new pilot program: an in-school partnership between Opera Time (musical storytelling that fosters literacy for kindergarten-second grade) and Link Up: Seattle Symphony. Link Up allows third-fifth graders the opportunity to “join the orchestra” in a highly participatory program in which they learn to sing and play recorder in the classroom, and perform with the symphony from their seats. Then, in the new year, Seattle Opera presents The Marriage of Figaro, Mozart’s endlessly enjoyable comedy of manners. General Director Aidan Lang returns to stage directing to mount his own production, which The New Zealand Herald called “engrossing, astute and unmissable.” Chinese bass-baritone Shenyang makes his Seattle Opera debut as Figaro, partnered by Nuccia Focile as Susanna. Morgan Smith returns as Count Almaviva, and Bernarda Bobro debuts as his forgiving wife. 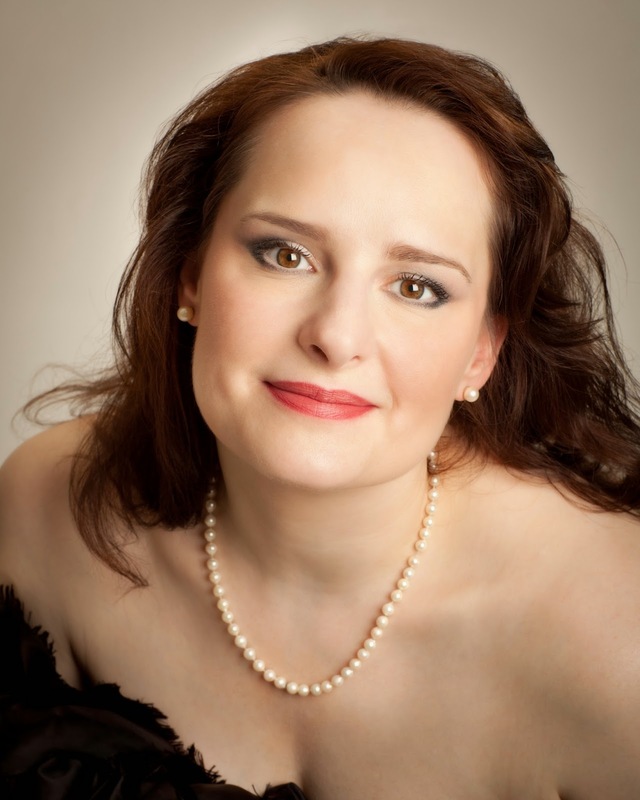 In the other cast, Aubrey Allicock as Figaro weds Talise Trevigne as Susanna. The ensemble also features Arthur Woodley, Steven Cole, Karin Mushegain, and Seattle Opera Young Artist alumni Caitlin Lynch, Elizabeth Pojanowski, and Deborah Nansteel. Gary Thor Wedow returns following Don Giovanni (2014) to conduct. A Seattle Opera premiere, Mary Stuart takes the stage next in February 2016. Based on Friedrich Schiller’s brilliant play, Mary Stuart dramatizes the battle of titanic wills between Queen Elizabeth I of England and her Catholic cousin Mary Stuart Queen of Scotland. In extravagant period costumes, these two iconic royals clash in a haunting story of jealousy, pity, doubt, menace, exaltation and remorse. Christine Rice and Joyce El-Khoury share the honors as Donizetti’s doomed queen, with Mary Elizabeth Williams and Keri Alkema as Queen Elizabeth I, her hated rival. Baritones Weston Hurt and Michael Todd Simpson appear as the scheming courtiers Talbot and Cecil. Carlo Montanaro is at the podium and Kevin Newbury makes his Seattle Opera debut as director. Finally, the company concludes the season doing what it does best—Wagner! In May 2016, several of Seattle’s favorite Wagnerians return to sing The Flying Dutchman, a tale of a cursed sea captain who can be redeemed only by true love. Greer Grimsley and Alfred Walker return as the Dutchman; Alwyn Mellor and Wendy Bryn Harmer sing Senta, who will break the doomed mariner’s curse. Nikolai Schukoff and David Danholt (winner of the 2014 International Wagner Competition) sing Erik, and Daniel Sumegi returns as Daland. A new production for Seattle audiences, this compelling and stylish show from the Canadian Opera Company brings together a visionary creative team in director Christopher Alden, set/costume designer Allen Moyer, and lighting designer Anne Militello. Sebastian Lang-Lessing, who made his Seattle Opera debut during the company’s 50th Anniversary Celebration in August 2014, returns to the podium. Inspired by the fate of the Dutchman, as well as the plight of the Israelites in Nabucco, Seattle Opera and the University of Washington College of Arts and Sciences will launch the first in an annual series of programs, performances, and events that will explore the theme of exile in the 2015/6 season. Together, with experts from a variety of disciplines in history, philosophy, literature, and the performing arts, audiences will extend and enhance their performance experience through multiple perspectives on historical and contemporary representations of exile. Programming will be offered in conjunction with performances of Wagner's work in May 2016. When hundreds of balloons dropped from the ceiling of the Arlene Schnitzer Concert Hall at the New Year’s Eve “Ode to Joy” celebration, the uproarious applause sounded a rousing conclusion to a spectacular calendar year. The whole year was capped off by one, important last-minute addition: the birth of a son to Music Director Carlos Kalmar and his wife Raffaela. Luca Pedro was born at 7:05 am on December 31, which explains why Carlos’ performance that same night conducting Beethoven’s Ninth Symphony appeared especially joyous. Mother and son are thriving. 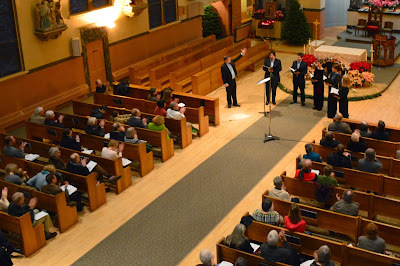 The Ensemble, led by artistic director Patrick McDonough, gave a fascinating Christmas concert of rare choral gems at St. Stephen’s Catholic Church on Sunday afternoon (December 28th). The program featured a number of songs by contemporary composers and a world premiere by American Linda Kachelmeier as well as selections of 20th Century composers, the earliest of which was the British composer Peter Warlock (pseudonym of Philip Heseltine), who died in 1930. Many of the works used text from anonymous sources dating back to the Middle Ages and the sophisticated sounds often embraced styles of earlier eras. Overall, The Ensemble made superb use of the warm and resonant acoustic of St. Stephen’s with just a handful of voices: sopranos Catherine van der Salm and Melanie Downie Robinson, alto Kerry McCarthy, tenor Nicholas Ertsgaard, baritone Erik Hundtoft, and bass Patrick McDonough. Excellent blend and dynamics were hallmarks of this concert. Clarity of tone and purity of vowels were at a marvelously high level, but ending consonants got a little lost at times. The concert began with “Four Medieval Carols” by Brian Holmes, who teaches physics at San Jose University and freelances as a horn player when he isn’t writing music. Each carol drew from text dating back to the 14th, 15th, and 16th centuries and some had the style of a madrigal. “Good Cheer” buoyantly welcomed Christ’s birth and the New Year. “The Moor Maiden,” which featured soprano Melanie Downie Robinson” had intriguing pauses that underscored its haunting serenity. According to scholars the lyric and enigmatic poetry in this song alludes to Mary Magdalene, although her name is not mentioned. Of much frothier complexion was “Nay, Ivy, Nay” even though it told of a contest in which Holly (masculine) won the upper hand over Ivy (feminine). “Jolly Jankin” described a clumsy and probably corrupt priest and a narrator who confesses her own ignorance. The next set of songs contained an ethereal performance of “There is no Rose” by John Joubert (South African), a gentle rendition of “The Virgin’s Cradle Hymn” by Edmund Rubbra (British), and a spirited interpretation of the “Corpus Christi Carol” by Trond Kverno (Norwegian), inspired by 15th century text that arrestingly mixed imagery of a knight of the Holy Grail with the crucified Christ. Soprano van der Salm and baritone Hundtoft evocatively sang the solos in that piece. The third set featured Peter Warlock’s soothing “Lullaby my Jesus,” which was graced with a crystalline high note from van der Salm plus Warlock’s “Bethlehem Down” with its lovely tranquil ending. Marvelous harmonies, an excellent tempo transition, and van der Salm’s solo passages enhanced “A Hymn of the Nativity” by Kenneth Leighton (British). The group’s stunning performance of “O Radiant Dawn” by Scottish composer James Mac Millan included huge swells of sound and the negotiation of exposed treacherous notes that would trip up most singers. The level of difficulty remained high with the singing of American composer Frank Ferko’s “The Snow Lay on the Ground,” which featured some expressive singing for the middle voices (alto McCarthy and tenor Ertsgaard). The fifth set presented a beautifully blended “Hodie Christus natus est by Niels La Cour (Danish), bell-like clarity in “Tota pulchra est” by Maurice Duruflé (French), excellent dynamic contrast in “O magnum mysterium by local composer Adam Steele, and a soaring soprano line at the end of “Ave Maria” by Frank La Rocca (American). The final selections, written by Linda Kachelmeier who lives in St. Paul, Minnesota, were inspired by familiar carols. “Good Kind Wenceslaus” featured a thick harmonic structure and fine solos by Downie Robinson and Hundtoft. It seemed that the “Coventry Carol” started a bit tentatively, but quickly got into the spirit of the carol even after a very tricky key change right before the final stanza. 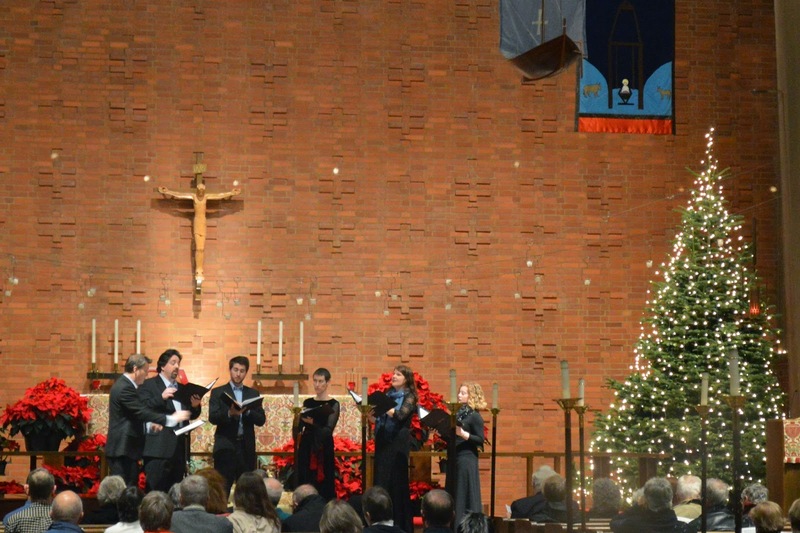 The Ensemble finished the concert by giving the world premiere of “God Rest Ye Merry, Gentlemen,” which included seamless trade-offs of phrases between members of the choir and a wonderful climax with the words “And with true love and brotherhood/Each other now embrace.” The audience rewarded the singers with extended, heartfelt applause, and hopefully, at another Christmas concert in the future, The Ensemble will present a few of these gems once more.